This is pizza by the slice, cooked Roman style. Eeny, meeny, miny, moe… choosing your pizza toppings ain’t going to be easy at the city’s latest opening. It seems ‘pizza al taglio’ is just like buses – you have none for ages and then they all come at once. First we got Poco, the Sicilian street food joint in Kirkstall, and now they’ve been joined by a new ‘by the slice’ venture in the city centre. 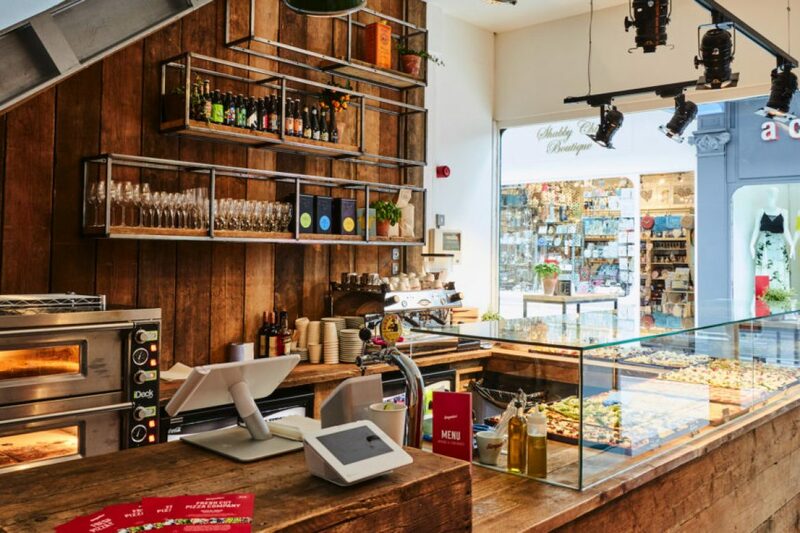 Simpatico is the latest addition to Queens Arcade and it’s the work of Nick Julian. After years working in the food and drink industry, both here and across the UK, he was inspired to go it alone – and it was all thanks to his old man. Nick’s dad lives near Milan, and when visiting, he got a taste of proper Italian pizza. It became something of an obsession and an idea began to form – could this work back home? His research led him to Rome where he trained under the acclaimed pizzaiolo Cristiano Garbarino. They don’t have a menu per se. 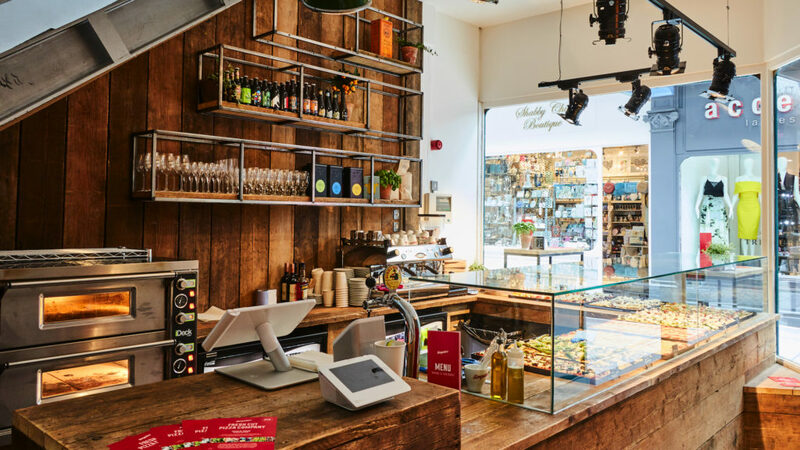 Instead, they put their pizza ovens to good use by cooking up an ever-changing selection – in fact, it changes so often that the slices on sale when you arrive might be different to the ones you can buy when you leave. They’ll be cooking up all the classics, so you can enjoy everything from Margherita to Pepperoni, but the toppings are far from conventional here and even the classics have been given a wonderful twist. Take the Caprese for example, it brings together tomatoes, mozzarella and basil on a crispy base. Want to try something a little wild? You could go for Lobster, Samphire and Crayfish or their Wild Boar & Hazelnut Cream pizza. No one knows their pizzas better than Nick, so who better to get a recommendation from? “Try our Porchetta pizza. It’s rolled pork, slow cooked with herbs and crispy crackling,” he told us. You can grab a slice on the go, and it certainly makes for a tasty snack, but the real perk of ‘pizza al taglio’ is the fact that you can try a range of different pizzas and experiment a little. They recommend 2-3 slices at lunch and 3-4 slices at dinner, but you don’t have to just eat pizza. They’ve got one of our all-time favourites – suppli. The sister to the arancini ball, these deep-fried risotto balls are so much like their more famous sibling that you’ll barely notice the difference, although traditionally there’s more of a focus on cheese, rather than meat. Here they’re made fresh in-house with their own original recipes, like fiery ‘Nduja sausage. Couple them with sides like salads and fries with rosemary and sea salt to make your own DIY lunch. There’s something you need to know about Mondays – they’re meat-free. If you want pepperoni, ‘Nduja, Prosciutto, sirloin, black pudding or any of their other lovely meaty toppings, go another day because it’s all about the veggies. You can tuck into wonderfully creative combinations like Asparagus, Broccoli and Stilton or Potato, Rosemary and Mozzarella. Good news for vegans too – you don’t have to rule out pizza anymore. They’ve created a range of pizzas especially for you, so you can enjoy those light, fluffy bases topped with unique combos like Chickpeas, Creamed Porcini Mushrooms and Yukon Gold Potatoes. They’re available throughout the week, but you’ll have even more options than usual on a Monday. All this is available to eat in or take away – but you might want to stick around. Simpatico is spread across two floors, with the bar downstairs and a seating area upstairs. It brings rustic furnishings together with striking murals from local artists like Nicholas Dixon – and let’s face it, if you eat in, you can grab another slice if you’ve got space. You can also take advantage of their range of Italian craft beers, many of which aren’t available anywhere else in Leeds. From La Zia Ale to Baladin Nora, they have quite the list for you to work your way through. Alternatively, you can treat yourself to a glass of wine, an Italian cocktail or just a cup of North Star coffee. This place is going to be popular, so get in there and grab a slice or two before the queues start wrapping round the block – after all, they only cost between £2.50 and £4 for a slice.